Looks like D*face had some new work up just before christmas which we missed. 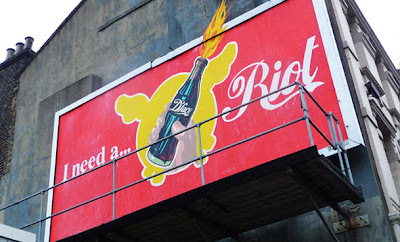 We are not sure if this "I Need A Riot" hand painted subvertisment, on a liberated East London billboard is still running as we have not seen any photos other than the ones which features on his D*Face website. haven't seen that one. Looks very nice! Wow what a subversive Dflake is. 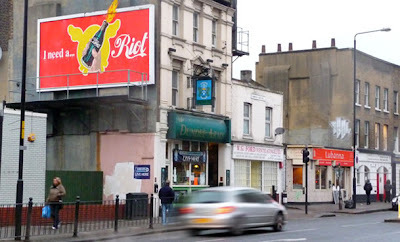 He paid a few hundred quid to hire the billboard space for a week or two off the the boards owners to put up another tired political statement that's been done a million times all the while sucking up to the same companies he decries and takes vast amounts money of vapid celebrities. Wake up you gullible f****! Nothing to see here but some hypocrisy and recycled 10th hand ideas. I was just thinking a similar thing and didn't even know the space was paid for!